Since 1956, the Visiting Scholar Program of the national Phi Beta Kappa Society has been offering undergraduates the opportunity to meet and learn from some of America's most distinguished scholars. "How do we ensure that verdicts in criminal cases are based on accurate evidence?" Professor Dan Simon investigates this question by examining how evidence is produced during the investigative phases of a criminal inquiry. 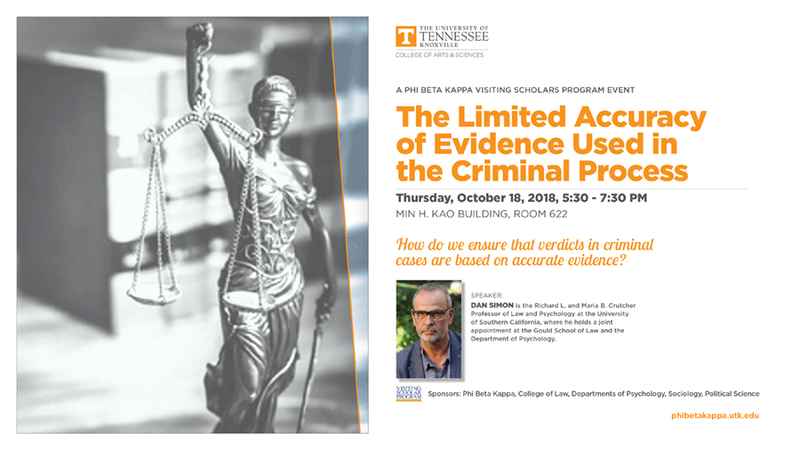 In his presentation, he explores how the conditions under which police investigators collect evidence, the cognitive aspects of accurate witness testimony, and the veracity of confessions borne by means of interrogation interact to produce a mix of accurate and erroneous testimony. Simon focuses on how errors are induced by the investigative process, as well as the means by which evidence drifts and errors increase over the course of the criminal process. His investigations provide a method to understand where the criminal justice process falls short of meeting the goals of certitude sought in criminal verdicts. In October 2015, UT's Phi Beta Kappa chapter was honored to co-sponsor, with the Department of Earth and Planetary Sciences, Timothy Rowe, Professor of Geology and Director of the Vertebrate Paleontology Laboratory at the University of Texas, Austin. Rowe delivered the lecture "Fossil Evidence on the Origin of the Mammalian Brain" to an audience of faculty, graduate students, and undergraduates. 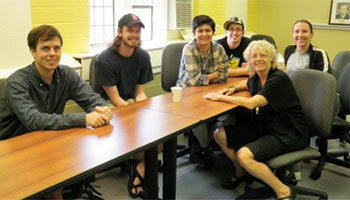 Rowe also led a seminar with undergraduates on Forensic Paleontology and met with a student lab group. In October 2013, UT's Phi Beta Kappa also co-sponsored with EPS the campus visit of Penelope Boston, Professor of Earth and Environmental Sciences and Director of Cave and Karst Studies at the New Mexico Institute of Mining and Technology. During her visit, Boston delivered a public lecture, "The Planet Within: Caves from Earth to Mars and Beyond," and an informal lecture to undergraduates, "Crunchy on the Outside, Tender on the Inside: Long-term Geological Persistence of Microorganisms."